I'm very (!!!) excited to share that Giving it Grace has recently been accepted into the Babywise Friendly Blog Network (BFBN). 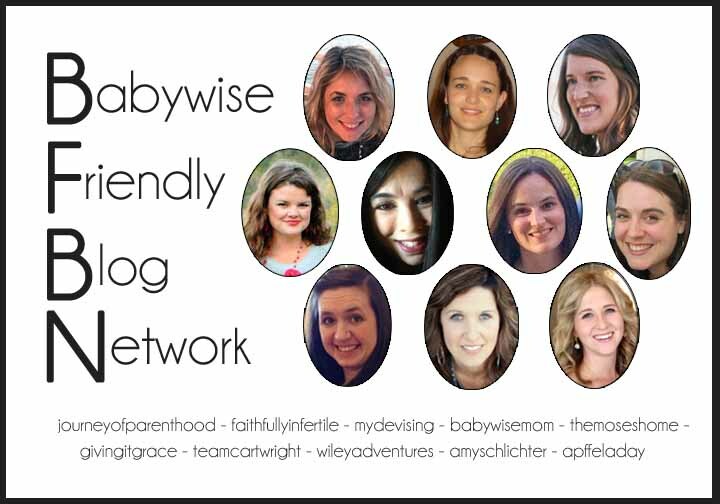 This is a network of 10 women bloggers tied together most prominently by our affection for all-things-Babywise. 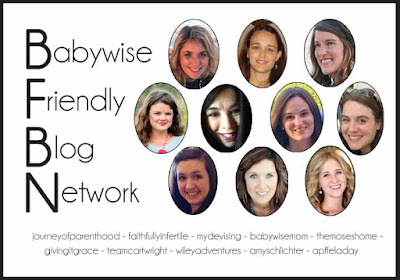 If you're a fan of Babywise, you've got to spend some time checking out the other blogs in this network - such amazing gals with wonderful blogs on a variety of topics! As part of the BFBN we get to guest post on each other's blogs from time to time. Today, Giving it Grace is enjoying a guest post from Emily at The Journey of Parenthood. Because I have not written extensively about Babywise on this blog before, I thought there would be nothing better than to hear from a seasoned mom on her choice to do Babywise for her sweet family (seriously - how cute are her kiddos?!). Enjoy! When I got pregnant with my first baby (back in 2008) I read all kinds of pregnancy books. I watched all the birthing tv shows. I jumped into all things pregnancy. What I didn't do, however? I didn't read up much about what it would mean to be an actual parent. Ya know...when the nine months of pregnancy ends and then you have a child to raise for the next 18 years?!?! When our son, Kye, was born I assumed it'd just all "click" with me. Everyone kept telling me that motherhood would come naturally. That I'd just know what to do. Um. I didn't. And I'm not saying that I don't believe in motherly instincts, I just know I personally felt pretty dang clueless about the whole parenting gig. Thankfully when Kye was about 3 weeks old a good friend of mine told me to order On Becoming Baby Wise. I remember the day I got it in the mail and after reading the first chapter I was sold. I immediately started to implement the techniques in our home. I found Valerie's blog and went through a big learning curve but still had a baby who slept through the night at 8 weeks old! It was not easy to adapt to the Babywise principles. It was a lot of work and it was tough to get others around me on board. Family had a hard time not getting to hold him a lot due to his frequent naps. Even my husband struggled to understand the why behind what we were working so hard at doing. Eventually though, it clicked. And really I don't think we understood just how large a role Babywise played in our parenting lives until we had our second child. When Britt was born (in Dec of 2011), I didn't feel clueless. I felt confident. I had a game plan. I knew what I was doing and I had my handy guidebook to lead the way. I also had an extremely well behaved, smart, happy, and great sleeper in my then 2 ½ year old who was proof to everyone that Babywise is legit. No one questioned what we were doing with our new baby. There weren't all the opinions or "helpful suggestions." People around us were more supportive, understanding, and even helpful in our Babywise journey with her. Having been through it with Kye helped others to see our "why" and to understand the importance behind good sleep habits, consistency in routine, and sticking to our eat-wake-sleep cycle. 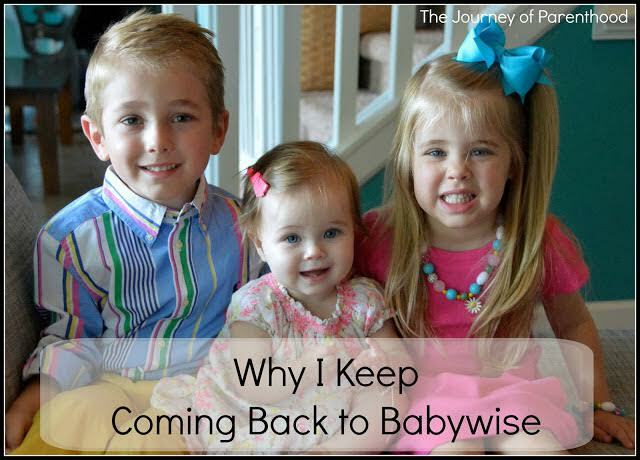 Not only were others more onboard with Babywise when we had our second baby, but we were so much more at ease with the whole process. We knew what to expect and understood that the tough early days would quickly pay off. Even though Britt was (and still is) a much different personality type than her brother, she still responded well to Babywise principles and she also slept through the night early on and is now a very happy, well-adjusted, easily adaptable, and great sleeping 3 year old! When it came to our third baby, my confidence was through the roof. People constantly asked if I was nervous about being outnumbered. Me? Nervous? No way! After being a "baby wise mom" for 5 years I felt like I had it all down and could sleep train a baby in my sleep. When Tess was born (in July of 2014) I not only had support from friends and family in my parenting decisions, but I had help! People knew how much we valued good sleep practices from early on and offered to come help care for our older children so I could focus on Tess and getting her acclimated to the world. With each baby I re-read Babywise from cover to cover. And even though I used the same principles for each of my children, they all responded in different ways. Kye and Tess had chronic 45 min intruder issues. Britt loved sleep from the start while the other two were lower sleep needs babies. Tess hit the 4 month sleep regression early and it was a beast. I think it's important to know that no matter how many times you've sleep trained a baby, that they will all respond in different ways. I went into my third time around expecting it to be smooth sailing and I was shocked when it wasn't as easy as I'd anticipated. Sure I knew the book cover to cover but this new little person? She hadn't read it. Even when you know the principles and are confident in the benefits, it is still a learning process. There are still times when I'd break down in tears. Times when I felt frustrated or defeated or like it'd never click with her. Now Tess is 10 months old. And like her older siblings she also slept through the night at around 8 weeks old. She wakes up happy from each nap, her little internal clock knows when it's nap time, she plays independently, she is always smiling, and is healthy as can be. When we have baby #4 (down the road!) I will go into that pregnancy with Babywise in hand. I will know to expect rough days, and tough times but I will also continue to be confident in the outcome that the hard work will provide. I am a true believer in the Babywise process and am thankful to have it as a guide in my parenting decisions.